Make a run. During this run, the Corp must pay Xcredit as an additional cost to rez the first unrezzed piece of ice approached. An odd card. It's sort of the bizarre love child of Vamp and Inside Job. Like Vamp, it has the potential effect of "Runner pays X and corp loses X", but without the nasty tag effect. Like Inside Job, it has the potential effect of "Get past a piece of ice for free", but can possibly target an inner piece of ice (if the outermost is rezzed but the inner ones are not). So whichever the corp chooses, you're getting a better effect than either of those two other cards. The thing is, you can't be really sure what the corp is going to choose. If you're making a Bribery run on a remote that you think has an agenda in it, maybe it's actually a SanSan City Grid and the corp will smile as you waste all your money on the run and are left without enough to trash it. On the other hand, maybe it actually WAS an agenda, and the corp decides it is worth a few extra credits to rez that Rototurret and trash your Corroder, leaving you scrambling for just long enough for them to score. Further complicating the issue is that you have to decide which effect you would prefer, and choose your bribery amount carefully to make that happen. Maybe your goal is to bankrupt the corp so that they can't afford to rez the ice over HQ to block your Legwork. In that case, you want to run an important-looking remote and throw down as much money as you can...but not too much, because if the corp can't pay X, or decides it isn't worth it, you'll just have a really expensive Inside Job. Conversely, if there's a situation when you are willing to pay buckets of money (say, you're on game point and you need to get into that remote), then unless you're winning the economic race you'll have to watch sadly as the corp matches you credit for credit and you end up bouncing off an Eli 1.0. Ultimately, I think it's too variable to be of much use. Maybe if a deck was already running both 3x Inside Job and 3x Vamp it might throw in Bribery as well, but otherwise stick to just one or the other. With @tiediedvortex review in mind, I'd like to throw in my two creds. Going off of the Vamp+Inside Job premise, I believe that Bribery could have a place in econ denial Criminal decks. The key to using this card correctly, I think, is to treat it as if it actually were an Inside Job and only ever spend 2 creds on it. This does two things: first, assuming the Corp doesn't take the bait, you are never paying more for Bribery than you would pay for the guaranteed effect of Inside Job. This is important because you aren't wasting your money on an effect you could get elsewhere for less creds. Second, if the Corp does decide to rez, you've forced them to lose 2 credits in addition to the rez cost of the ICE. 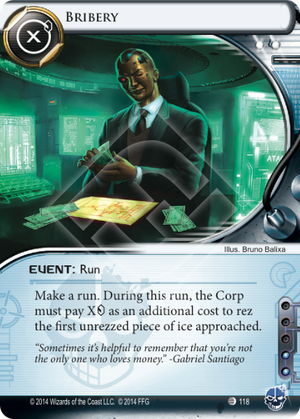 2 credits may not seem like much, but in a deck that is all about keeping the Corp poor (maybe Reina Roja: Freedom Fighter?) Those 2 creds could be the difference between clicking for creds and a Hedge Fund or rezzing a SanSan City Grid. Now it's important to note than this is not a replacement for Inside Job. Bribery can function as one in select circumstances, but Inside Job can still get you past rezzed ice guaranteed. However, in an econ denial deck I believe it has potential (especially in Ken "Express" Tenma: Disappeared Clone, mitigating the tempo hit on yourself).